To him who loves us. Those words are so powerful, and sometimes…sometimes so hard to believe. Unconditional love can be nearly impossible to understand and accept, but it is what Jesus Christ has for us. No matter who we are, no matter what we look like, no matter what we’ve done, Jesus loves us. Oh, how we’d act if we realized the depths of his love! Trusting in that love—letting it soak into us—softens our hard areas, soothes our hurts, and roots us in security. Like a warm blanket on a cold winter day, God’s love is something we can sink into and rest in its depths. Love does that, doesn’t it? It gives us sure footing. It allows us to see our value. It breaks apart our loneliness. 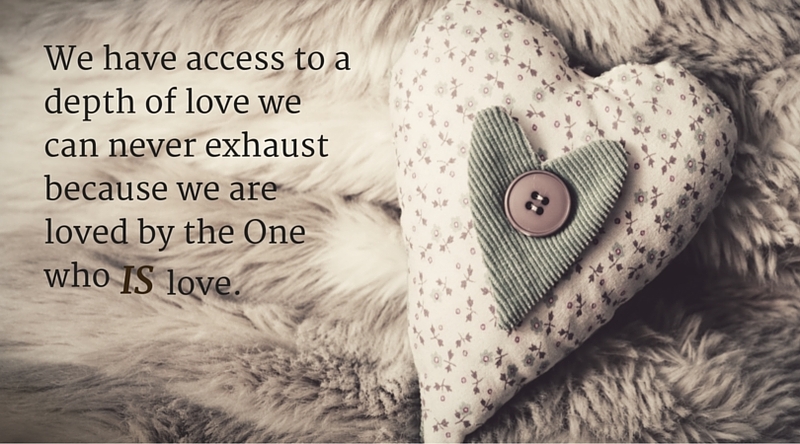 Love is incredibly powerful, and yet so many of us miss the fact that we have access to a depth of love we can never exhaust because we are loved by the One who is love, and he offers it freely to all. Friend, down here on earth we may mess up love. People will get it wrong, but God never will. His love is perfect, and it’s waiting for you to step into today. Lord, please let me feel your love today. Open my eyes to the way you show it. Strike down any thought that tries to keep me from believing it, and let me accept every drop of affection from you today. Fill me with your all-consuming love, Lord. Amen. Thank you Susan. This is a concept that I've been working through for the last few years. Trusting God can only come after knowing he loves us. He ALWAYS has our good in mind, even when it doesn't feel like it. Thanks for the reminder and the encouragement.